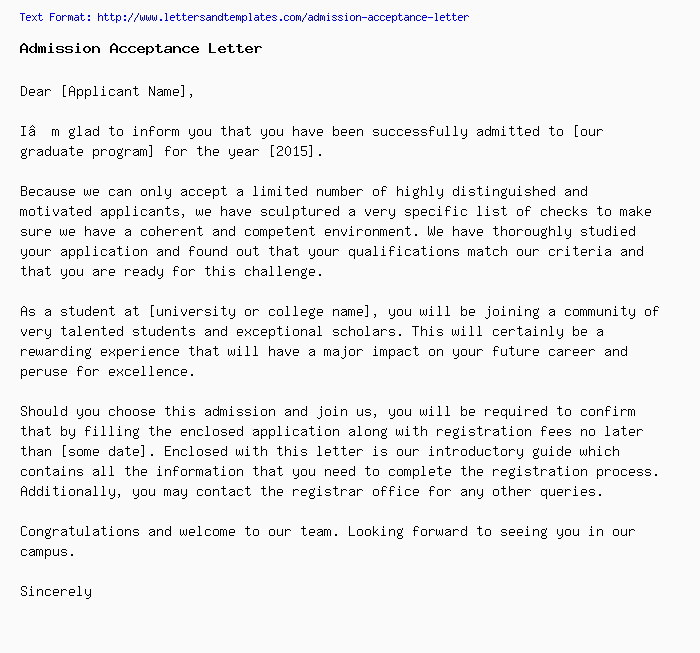 I’m glad to inform you that you have been successfully admitted to [our graduate program] for the year . Because we can only accept a limited number of highly distinguished and motivated applicants, we have sculptured a very specific list of checks to make sure we have a coherent and competent environment. We have thoroughly studied your application and found out that your qualifications match our criteria and that you are ready for this challenge. As a student at [university or college name], you will be joining a community of very talented students and exceptional scholars. This will certainly be a rewarding experience that will have a major impact on your future career and peruse for excellence. Should you choose this admission and join us, you will be required to confirm that by filling the enclosed application along with registration fees no later than [some date]. Enclosed with this letter is our introductory guide which contains all the information that you need to complete the registration process. Additionally, you may contact the registrar office for any other queries. Congratulations and welcome to our team. Looking forward to seeing you in our campus. We are pleased to inform you that your [son/daughter] has been successfully accepted in our school for the scholastic year [2015/2016]. We are sorry that we had you wait for long period of time, but as you now we have very specific criteria when it comes to new admissions so that we can keep an academically levelled and coherent atmosphere. In order to reserve your child’s place, you are required to fill and submit the registration application as well as the registration fee no later than [some date]. Because seats are limited, we won’t be able to guarantee your child’s seat if submitted after the indicated date. Congratulations and welcome to our school.